Something big is happening at Euston. You can sense it in the trees. The High Speed 2 rail link from Euston to Birmingham is not set to open until at least 2026, but workers in high-vis are already busy at the London terminus. We took a walk around the back of Euston to see how the enabling works are affecting the local area. The first thing you notice is the knitting. 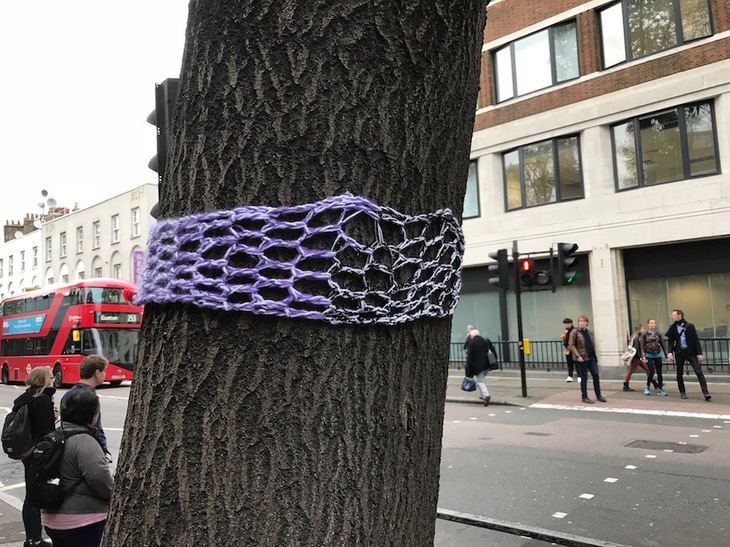 Dozens of trees around the station have been yarn-bombed. 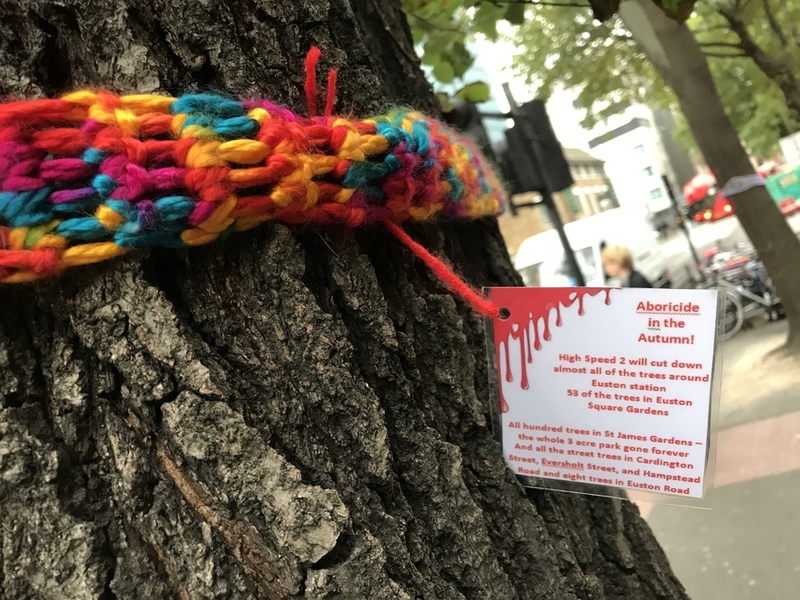 The woolly decorations first appeared in May, a uniquely delightful way to protest. 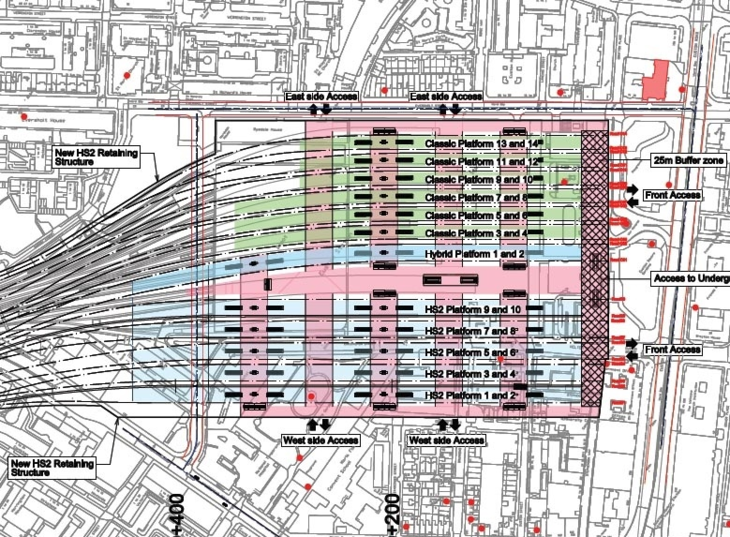 High Speed 2 will cut down almost all of the trees around Euston Station. 53 of the trees in Euston Square Gardens. 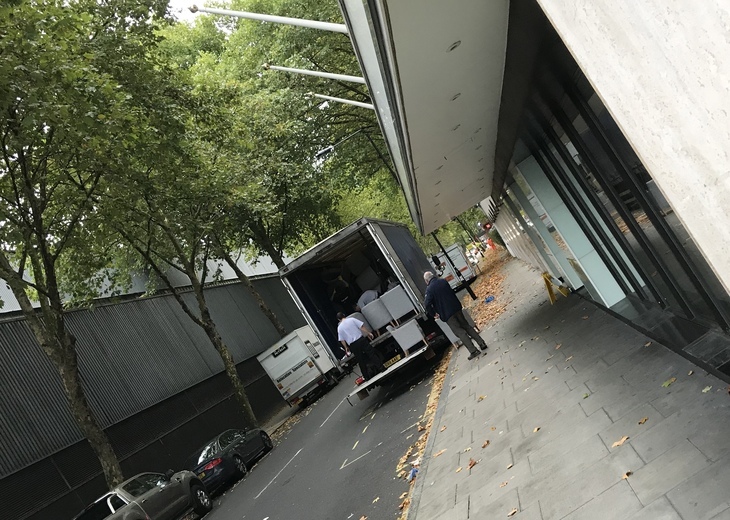 All hundred trees in St James Gardens — the whole 3 acre park gone forever. And all the street trees in Cardington Street, Eversholt Street, and Hampstead Road and eight trees in Euston Road. That is a disquieting tally, and yet miniscule compared with the number of trees that must be uprooted between here and Birmingham. In fairness, HS2 has promised to plant 7 million new trees along the route, and a contract has already been awarded to grow the saplings. As noted on the yarn-bomb tags, HS2 will also do away with St James Gardens — an old burial plot turned public park. On walking down Cardington Street, we find that 'will' is the wrong tense. The park is already closed, and full of people in hard hats. It's difficult to see if tree-felling has already taken place, but there's certainly plenty of activity behind the hoarding. Further down the road, the former Thistle Hotel has closed, and the removal guys are stripping it of furniture. 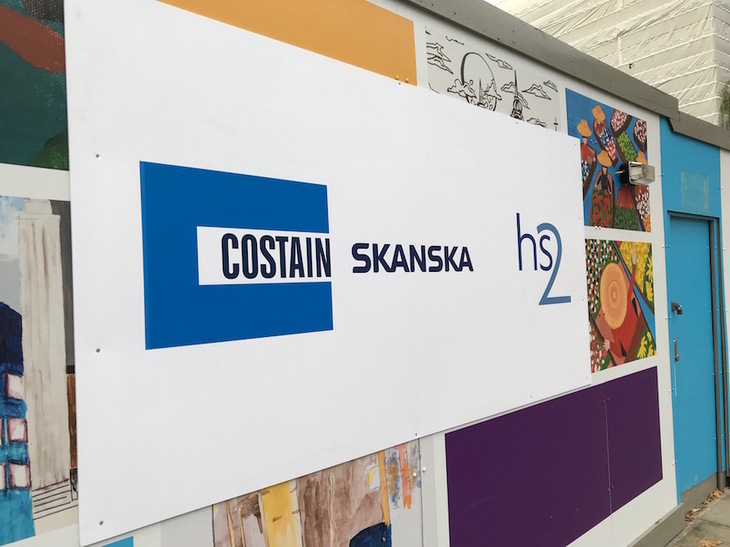 The building will be demolished for HS2. Few will mourn the architecture. HS2 will muscle out more than just a park and chain hotel. As the diagram below shows, the new platforms will delete several streets in the area. The much-loved Bree Louise pub on Cobourg Street will have to go, along with homes and small businesses. A former tube entrance, covered in the distinctive oxblood tiles of Leslie Green, will also be razed. The nearby Magic Circle headquarters on Stephenson Way had a Houdini-like escape. The affected streets and new platforms are to the bottom of the plan. North is to the left. 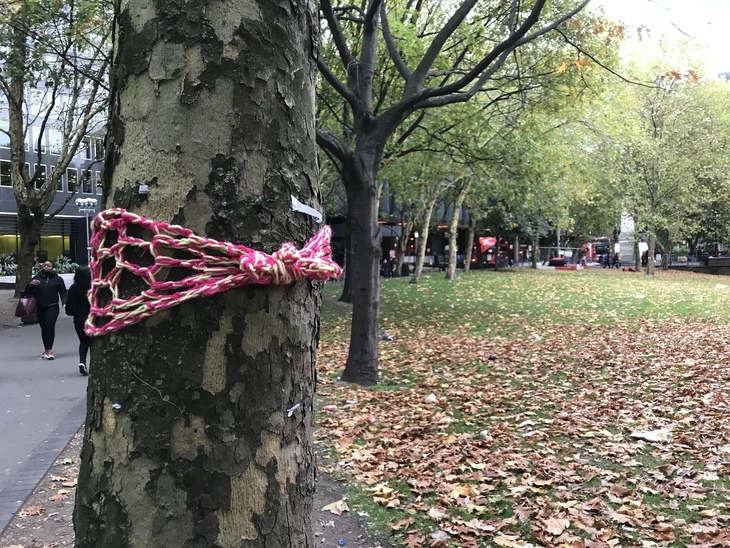 Back round the front of the station, we notice further yarn-bombing in Euston Square Gardens. 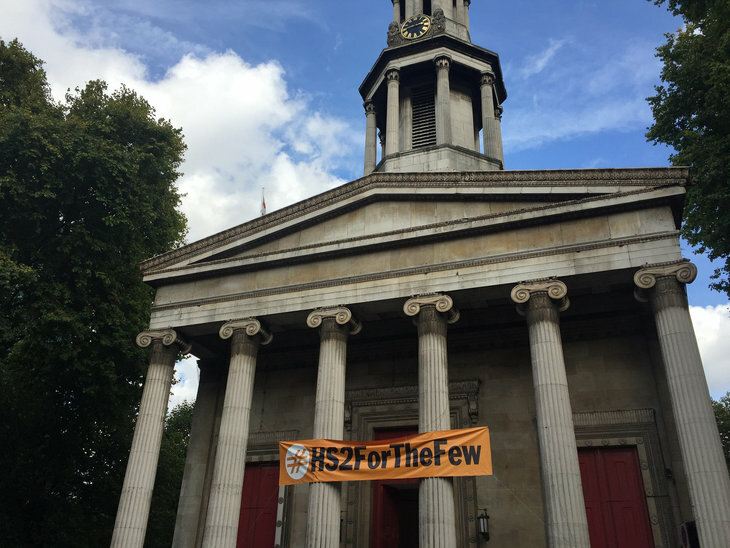 Across the road, St Pancras New Church flies an anti-HS2 banner, with a — dare we say it? — questionable insinuation that the rail link will only be used by 'a few'. The church has a direct connection with the HS2 enabling work. Its famous caryatids (statues of women serving as columns) were modelled by Charles Rossi, one of those buried in the upturned St James Gardens. Despite the protests, HS2 seems to be gathering a head of steam, with boots already on the ground and contracts signed. 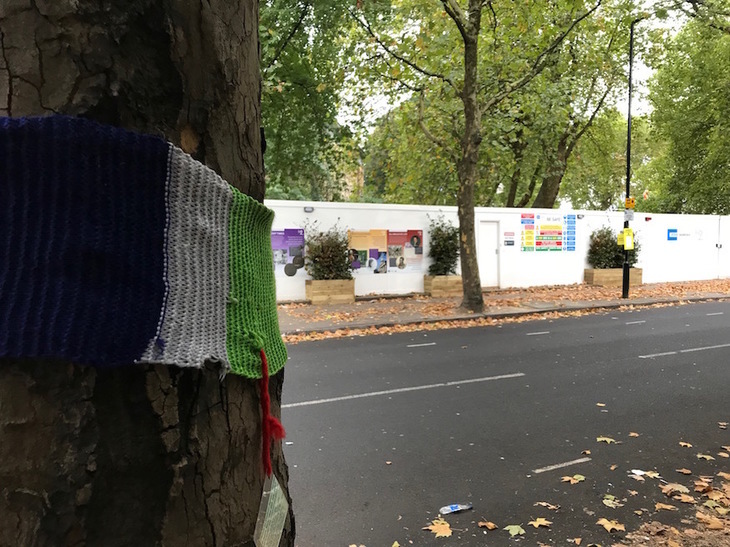 Like the resilient knitting on the trees of Eversholt Street, it's hard now to see it unravelling. More info: Like any big engineering project, HS2 has strong and vocal lobbies both for and against. Here's a good article laying out the pros and cons of the project. Here is the government's strategic case for the project, and the HS2 Action Alliance case against.